The discovery of the similarity of Sanskrit with European languages by Sir William Jones led to the theory of that there was originally a Proto-Indo-European language (PIE) from which all the related languages evolved. The Proto-Indo-European linguistic problem then became the Proto-Indo-European biological problem and it morphed into the Aryan Invasion Theory with Aryans invading and displacing Dravidian speakers from the Punjab region. For linguists, one important question is in finding the time frame of this hypothetical language. There must have been a time when PIE originated, stayed alive and then ceased to exist. It is believed by some linguists PIE originated between 4000 – 3500 BCE and died by the start of the Mature Harappan Period (2600 BCE). This seems like a Dravidian nationalist dream come true. But all is not well with this theory. If you notice the map, you will find that the Dravidian speakers ending up in the Brahui region of Balochistan. While it was believed that they were the remnants of the Dravidian speakers who did not migrate to the South following the arrival of the Indo-European speakers, it is now believed that they migrated from Central India in 1000 CE. There are other serious issues as well. There are many variables in the reconstructions, and many the forms themselves often bear little resemblance to mainstream Indo-Europeanists’ reconstructions. The semantic looseness is often extreme. For instance, the database glosses a reconstructed form *(a)den@gh- (where @ = schwa) as `to reach, to seize, to have time’. Among the proposed descendants of this form are a Tocharian B form meaning `rise, raise oneself up’, an “Old Indian” (Sanskrit?!) form meaning `reach, strike’, an “Old Greek” (Ancient Greek?!) form meaning `with the teeth, biting together’, and an Old Irish form meaning `repress, oppress, suppress, crush, put down’. This is typical of the semantic latitude. Formally, too, there are problems. The proposed “Old Indian” descendant of this proto-word is given as daghnoti, possibly on the assumption that the nasal of the reconstructed root metathesized with the gh; but the nasal of the Sanskrit form is a present tense suffix, not part of the root at all. So Sanskrit (by whatever name) doesn’t match the database’s proto-word phonetically. Second, Reich agrees that the ANI (West Eurasian, “Ancestral North India”) admixture into the India population exhibits at least two admixture events. There were hints of this in the original 2009 paper, and looking more closely at the South Asian data others have suggested this more explicitly. This seems the best explanation for why non-Brahmin upper castes in South India do exhibit distance on the ANI-ASI cline from lower castes, but without clear connection to many ancestral components with a “northern” affinity present at non-trivial levels in Indo-European speaking groups and South Indian Brahmins (or those groups which have admixed with Brahmins, such as Nairs). 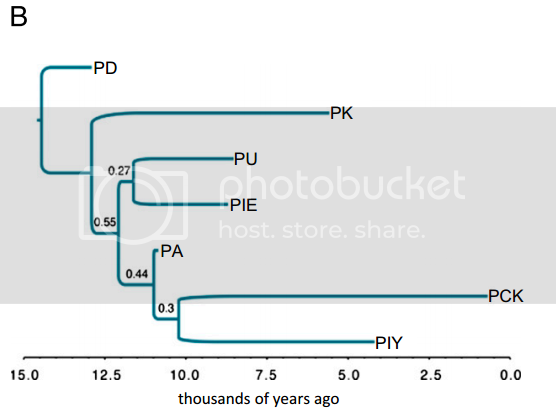 The hypothesis I prefer is that there was an initial wave of West Asian agriculturalists who arrived in the Indian subcontinent <10,000 years B.P., and admixed with the ASI (“Ancestral South Indian”) substrate. Then, there was at least one further substantial demographic wave of West Eurasians, probably bringing the Indo-European languages. This population had more northern affinities (though not exclusively; the Basque vs. non-Basque difference in European seems to be a West Asian element), which explains the subsidiary minor explicitly European-like element found in many upper caste populations, and to a lesser extent Indo-European speaking South Asians generally. Finally, I do suspect that some groups in the Northwest, such as Jatts, were shaped by later migrations. I have the impression that the Aryan Invasionism follows the same method as Creationism. The supporters of the Indo-Iranian invasion from the European steppes of Central and South Asia have no sacred text to defend, although sometimes they use the Vedas or the Avesta with biased (often racial) interpretations. They have a sort of preconceived faith, maybe based on a secret, obstinate Eurocentrism: Europeans must be the conquerors of the Indo-European world, and not the conquered or colonized, they must be the origin of the change, not the recipients.So, they already firmly believe that the Indo-Aryans must have arrived there in the 2nd millennium BC, and so we have to find, in one way or another, the facts able to support that dogma. I think that we should rather start from the archaeological facts, and build a theory from there, seeing if we find a harmony with linguistics and textual traditions, and also genetics. Someone could object (with Nietzsche) that there are no facts, only interpretations, particularly in the realm of prehistoric archaeology, but still, there are worse and better interpretations. The evolution and connections of material cultures can give a reliable picture, which can be mirrored by the linguistic and textual tradition. Sure enough we found an alternative possibility on the streets of faraway Penang in Malyasia. On Pitt Street to be exact, named by the British after the Prime Minister, William Pitt, the Younger. The street is now called Jalan Masjid Kapitan Keling, after a mosque built by a South Indian Captain of a ship. Down the street one finds the Tamil area of Chulia Street, formerly called Muchanti (junction). A little away from this junction on the Penang Road, we come across a notable Malabar monument, in Kampung Malabar (the Malabar colony), named after a faith healer from Calicut named Syed Mustafa Idris Koya. The entire Penang Road is known in Tamil locally as Ezhu Muchanti (the junction of seven roads). Muchanti in Tamil means a junction and perhaps meant the same in 13th century Malayalam, too. 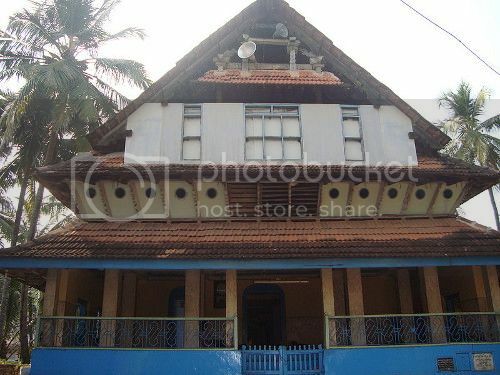 Muchunti Palli in Calicut is also situated on a junction where three paths meet. Did Muchanti Palli become Muchunti Palli in due course? It was on such a tense day in Tuticorin during 1534, when as usual, a Parava woman went out to sell her home made Paniyarams. As it appears from the texts of Teixeira, a Muslim insulted her and the lady promptly went home and complained to her husband. The enraged man went out and a fight ensured with the Muslim, during which the Muslim cut off an earlobe of the Parava, a great insult indeed for they wore large ornaments on their ears which extended down to their shoulders. So the honor of the entire community was compromised, as Schurhammer reports. The two groups went at each other’s throats and a great many were killed. The Muslims of neighboring towns joined the fracas and the Paravas were systematically decimated (in fact a bounty of 5 fanams per head were initially paid to the mercenaries, but as the heads piled up, this was reduced to one fanam). The Paravas had nowhere to go and were in a dire situation with no hope (A little exaggeration can be seen in these accounts – since the Muslims needed the Parava to eventually go out to sea and continue with their business and pay them the taxes).It was into this mess that the indebted Joa Da Cruz strayed. The Paravas talked to him and explained their desperate plight. Seeing an opportunity to redeem himself, Da Cruz suggested that they convert and get allied to the Portuguese to save themselves. The Paravas, seeing no other alternative, agreed. Clavius’ work, which responded to and was inspired by Arabic mathematicians and scientists in Latin translation, here a generation after its publication is translated back into Arabic to be read, presumably by elites at the court of Aurangzeb, where the work’s translator and his son were courtiers. This translation demonstrates the complexity of knowledge flows – that they were synchronic as well as diachronic, and also involved a process not just of translation, but of re-translation, re-interpretation and development as they travelled. Furthermore, the inscriptions taken in tandem, one in English made by an East India official, the other in Arabic by a Mughal courtier, open the possibility that already in Aurangzeb’s reign, Mughal elites travelled to Europe perhaps to study. In the case of Mu‘tamid Khan, the translator of this text, he mastered the technical idiom of geometry and mathematics in Latin, and then translated it into an equally complex scholarly language, Arabic. Not an uncommon intellectual feat at the Mughal court, this process of scientific translation remains to be studied in depth. It is also possible that the presence of the Jesuits at Goa had an influence on the production of this translation, but firm evidence remains to be found. This one does not need any commentary. Summing up, our results confirm both ancestry and temporal complexity shaping the still on-going process of genetic structuring of South Asian populations. This intricacy cannot be readily explained by the putative recent influx of Indo-Aryans alone but suggests multiple gene flows to the South Asian gene pool, both from the west and east, over a much longer time span. We highlight a few genes as candidates of positive selection in South Asia that could have implications in lipid metabolism and etiology of type 2 diabetes. Further studies on data sets without ascertainment and allele frequency biases such as sequence data will be needed to validate the signals for selection. The point is that nothing exciting happened following the decline of the Harappan civilization. The Dravidian folklore is just that – folklore. Migrations did happen to the region, but they date to much earlier period before there were Dravidian and Indo-European languages. Recently Saudi Arabian officials claimed they have evidence that horses were domesticated in the Arabian peninsula around 9,000 years back. “This discovery will change our knowledge concerning the domestication of horses and the evolution of culture in the late Neolithic period,” he told a news conference in Jeddah, according to the Reuters news agency. “The al-Maqar civilisation is a very advanced civilization of the Neolithic period. This site shows us clearly, the roots of the domestication of horses 9,000 years ago,” he added. This is shocking: archaeological news from a country which has declared war on archaeology? The website of the Saudi Commission for Tourism and Antiquities has a large number of photos from al-Maqar. 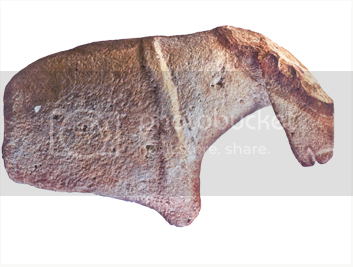 One of the artifacts is a sculpture of a horse around 100 cm long. On this horse, there are signs of a bridle which proves that the horse was domesticated much earlier than what we thought before. While this is interesting news as it pushes the antiquity of horse domestication by a few millenia, it has a serious impact on a version of Aryan Invasion Theory which depends on the date of horse domestication. According to this version of history, the Indus civilization fell to the invaders. In The Wonder that was India, A L Basham gives a dramatic account of this fall. According to him, the barbarians who were already ranging the provinces finally made their move. The citizens of the Mohenjo-daro were no match for the invaders who had superior weapons. Basham also notes that the invaders trimphed because they had the terror striking beasts of the steppes. These terror striking beasts are horses which till last week was considered to be first domesticated in the steppes of Central Asia. They were probably first domesticated by the Botai people of Kazakstan. In fact there is no dispute over the fact that horses were alien to India and were domesticated by nomads in the Pontic-Caspian region. According to one of the Indo-European homeland hypothesis known as the Kurgan theory, these mounted warriors from this region, after domesticating the horse used this advantage to impose their culture on their neighbors in Old Europe. These “Aryans” then displaced the “Dravidians” in a kind of fairy tale. What happens to this theory if the horse was not domesticated near the Caspian sea, but somewhere in the middle of Saudi Arabia as per the new evidence? Did the horsemen wait for few millennia to time their adventure with the decline of the Harappan civilization? If the Aryans indeed came from the Caspian sea area, what prompted them to make a move around that period? After attending a lecture on the latest in Harappan excavations, Koenraad Elst writes that there is still no trace of an Aryan invasion. So, a very simple question would be: did Cameron Petrie, as a field archaeologist fresh from the recentmost excavation, ever come across actual pieces of evidence for an Aryan invasion. He smiled and agreed that he too had no such sensational discovery to announce. So: as of 2011, after many decades of being the official and much-funded hypothesis, the Aryan Invasion Theory has still not been confirmed by even a single piece of archaeological evidence. The original name of the Malabar hill, point area was Shrigundi. The story is described thus: Shri-Gundi is called Malabar Point after the pirates of Dharmapatan (That is near Tellichery – Curious! ), Kotta, and Porka on the Malabar Coast, who, at the beginning of British rule in Bombay, used to lie in wait for the northern fleet in the still water in the sea of the north end of Back Bay. The name Shri-Gundi apparently means the Lucky Stone. In a two part post (1,2)Sriram writes about the German links to Carnatic Music. Schwartz became poet, guide, philosopher and friend to Sarabhoji. Among the many subjects he taught the avid prince was an appreciation of Western Classical Music. This led to many new influences in the field of Carnatic music as we shall see later. In order that Sarabhoji did not feel lonely, Schwartz brought in Vedanayagam (1772-1864), then a boy of 12, to be the prince’s companion. Vedanayagam came from a devout Christian family of Tirunelveli. In course of time he became a great scholar and was referred to as Sastriar. In his post Anthropometry and Anglo-Indians, Fëanor writes about the anthropometric studies of 20th century Bengal. If you find interesting blog posts on India history, please send it to varnam.blog @gmail or as a tweet to @varnam_blog. The next carnival will be up on April 15th.